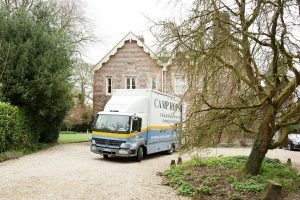 Camp Hopson is the choice to make when you want a removals company in West Berkshire that knows what it’s doing and is fully familiar with the area. It makes a big difference. We’ve been moving people for seventy years and our experience is considerable – it gives us an expertise that cannot be quickly acquired. There’s no moving problem we haven’t encountered and so by the same token we know all the solutions. For every moving question, we’ve got the answer. And for every relocation quandary, we’ll provide clear-headed advice and insight, making sure you’re apprised at every stage of the process. Our BAR-trained staff can help you with every aspect of your move. They can undertake all the packing-up and all the unpacking at the other end, leaving you free of toil. All Camp Hopson teams have a proper understanding of how to package fragile goods and how to arrange delicate furniture so that it’s safe in transit. We’ve got all the necessary equipment and specialist packaging materials a move requires. As we take your belongings out of your old house, we’ll be sure to protect banisters, walls and carpets from damage as we go, and we’ll do the same in your new home. Removal companies in West Berkshire are not all as considerate or thoughtful. Storage in West Berkshire is another service we offer. Use our facilities and you’ll find them ideal for any needs. Whether you want to store a considerable amount of furniture or just a handful of things, we’ll arrange the right level of space for you. Everything will be carefully inventoried and categorised. When you need your items back, we’ll deliver them promptly to your door. It couldn’t be easier. You’ll notice the Camp Hopson difference from the moment our estimator comes to call, to grasp all the details of your move and then prepare an accurate quotation. With seven decades of moving behind us, we’ve created a stress-free, streamlined approach that’ll change the way you see the whole process.